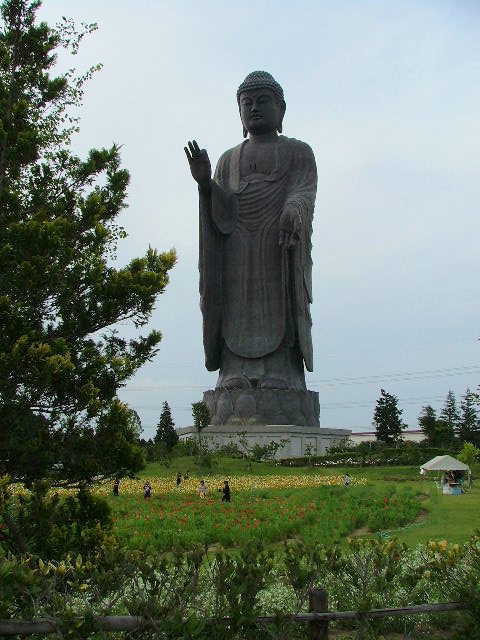 Ushiku Daibutsu has been authorized as the tallest statue in the world since 1995. The figure of Amida Buddha, overlaid with 6mm thick plates of bronze, is 100m tall and stands upon a base pedestal and lotus platform, each 10m high. So, its total height is 120m from the ground. The monument is three times taller and thirty times larger in volume than the Statue of Liberty. More than 6000 plates were required to overlay the body of the statue, and each plate formed the complex configuration. Inside of Daibutsu from entrance until reach to elevator is spread illusion world of Buddhism.